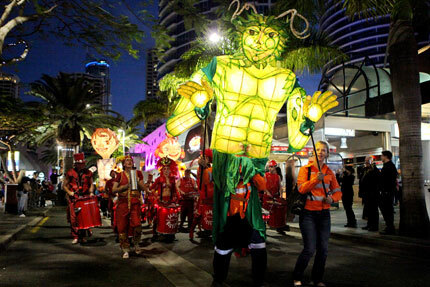 Fingers crossed this lovely weather holds out for the Surfers Paradise Festival Street Parade tomorrow evening. I’m hoping to take the family along to check out the amazing displays, before hubby and I head off on first date night since December (to the Craig David concert for work and pleasure). (Thankfully my fab mum will be able to put the kidlets to bed for us). Anyway, back to the Street Parade. See the Gold Coast gather to celebrate the coming of the Surfers Paradise Festival for 2013 with a lantern parade peopled by community groups, school children, marching bands and acrobats. Whether you tweet it, sing it, post it, pin it or say it… let the word go forth: the Surfers Paradise Festival has begun! Surfers Paradise Festival Street Parade will commence from Alison Street, and turn left to march north along Surfers Paradise Boulevard. From there, we will take a right turn onto Cavill Avenue, and move into Orchid Avenue, turning right at Elkhorn, and then moving south along the Surfers Paradise Foreshore to the finale at the Surfers Paradise sign.